How many cups of batter will I need for my wedding cake? I'm going to be making my own wedding cake. We are not have a huge wedding so I bought a 14x3, 10x3, and a 6x3 pans. My fiance doesn't want the tiers to be 2 layered that's why I bought the deeper pans. I'm wanting to make your yellow cake batter but I have know idea how many cups of batter I am going to need. Please tell me what you think about this. ANSWER: Hi Ann Marie, Congratulations on making your own wedding cake. After your wedding please upload a photo of it for us. 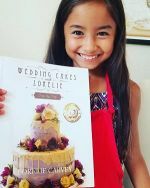 Here is the link to tell your story and show off your DIY Bride cake. The Batter amount chart is at this link. You will see the amounts for a 14 10 and 6 inch rounds. The yellow cake recipe is already multiplied for you at the recipe page. Making a single thicker layer is not something I recommend. When you make the cakes in the deeper pans the cake has a tendency not to rise as high. As a result it may be denser. 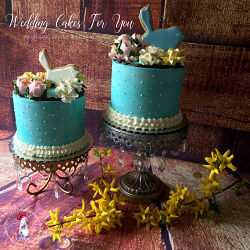 For this reason you may want to ask the groom if he would change his mind and bake your cakes in two 2 inch high tins instead and fill the cakes. If you do go with a single layer then bake the cakes at a slightly lower temperature. If it rises too quickly it will fall in the center and will not be cooked all the way through. Comments for How many cups of batter will I need for my wedding cake? Hi Gloria, I have a book with all of the information in it about batter amounts. 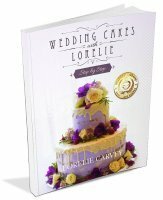 It's called Wedding Cakes with Lorelie Step by Step and it's available on Amazon now. 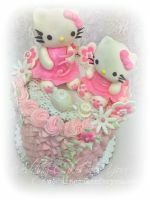 I came across your website by chance while I was looking for help with wedding cake and it's just what I need. 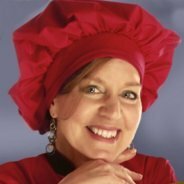 I find your cakes, tips and how you respond to people's questions... amazing. I am trying to make a wedding cake for a friend and this will be my first attempt although I bake normal cake for my family. I am trying to make 3 tier using 11,8,and 5 inches pans. I will be really grateful if you will give me the right amount of ingredient for this sizes. In addition, when I bake my cake sometimes it doesn't rise properly and or rise evenly. thank ever so much in advance. 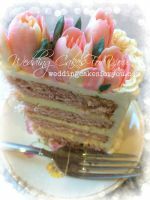 Hi Khatra, Thank You :-) I'm glad you found Wedding Cakes For You and are finding it helpful. There is a batter amounts chart on this site to serve as a guide. Generally you will want to fill your pans no more than 1/2 to 2/3 full allowing for the cakes to rise in the pans. I do have the white cake recipe already figured out for those size pans. The recipe is multiplied by three. It is for a 12 8 and 6 (close enough) If you have extra batter you can always make a couple of sample cupcakes. You didn't say whether your pans are 2 or 3 inches in height? I prefer the 2 inch high pans versus the 3 inch ones, baking two layers and then filling. But you can bake the cakes higher and then split. The cakes will take longer to bake and be slightly denser. If your cakes are baking up uneven it could be that your oven is not level or the oven has hot spots. In either case shift your cakes around as they are baking. If your cakes are not rising properly then it could be several factors. Check the temperature of your oven first, you may have to lower or raise it slightly. I bake mine at a lower temperature. All ovens are different. Get an oven thermometer to be sure. It could be that your baking powder is old and needs replacing. Cold eggs or butter can be the culprit. Overmixing or undermixing can also cause your cakes not to rise enough. If you over mix the cake they become heavy due to the gluten over developing, if you undermix the gluten is not developed enough and the structure will be weak causing it to fall in the middle. Good luck with your first wedding cake. Please send along a photo of your cake when it is finished. We would love to hear about it and see it and maybe you can give some helpful tips or advice after you are through. and stacked on top of each other will that look okay. I prefer the taller ones myself, but it will still look pretty, and if that is what she wants I guess you sort of have to grant her wishes. A: You 're welcome If you go to my RECIPES page you will see the link to the fruitcake. You will need to multiply it many times over to make a wedding cakes. The recipe there makes a 10 inch cake. Firstly can I thank you for always being available and helping with your excellent advice. You never fail to respond immediately. Your advice is precise and crystal clear which really makes all other baking sites pretty redundant! My question this time is, do hexagonal cake pans take the same amount of batter as square pans? In July I am baking my own 60th birthday cake and the decoration of mogul arches and paisley pattern lends very well to that shape. Tin sizes will be 10", 8" and 6" hexagonal. This is a very strange time for me. Ten days before my birthday I am baking a three tier wedding cake for my friend's son's wedding using your chocolate wedding cake recipe. That day is also my own wedding anniversary so, yet another cake! If you have another recipe (easy one please) it will be so gratefully received. I prefer to bake layer cakes because I am useless at torting and desperately in need of tuition to master this mysterious art! Many thanks Lorelie, with very best wishes. I would say the amount of batter is pretty close to the amount for a square pan. Ironically I never measure batter amounts. I do have a chart on the baking page but it does not include hexagonal pans. I will continue to search my books for it and let you know when I get the exact information. If you are using the buttermilk chocolate recipe than the recipe times 4 should be plenty for that size cake. This yellow cake recipe is an easy one. Try it with a simple vanilla or almond buttercream. Good luck with your busy schedule. Happy 60th Birthday, Happy Anniversary and Happy Cake Decorating!!! You Go Girl!!! Thank you for posting information for my above inquiry. My thanks also to Sarah who provided the information on face book via your site. Hi, How do I know the right amount of batter for a 10 inch cake tin? Does the cake need to go in the fridge or can it stay out? I want to make a moist chocolate cake for a 21st birthday, for 25 people. Looking forward to hear from you. Hi, You will want to fill your pans to about 2/3 full. You may want to try my chocolate cake recipe It is very moist. You will need about 4 1/2 - 6 cups of batter per pan. (assuming you are doing a two layer cake and are using two 10 inch pans 3 inches deep.) Are your pans 2 inch deep or 3? This will also make a difference as to how much batter. If you have deeper pans you can fit more batter in them and then split the cakes in two for more layering. You will need to do a little experimenting on your own to figure out what is best for you. Use my suggestions as a guideline. Here is a batter amounts chart on this website at the cake baking tips page. Whether or not the cake can stay out for a period of time depends on what type of filling and frosting you use. A buttercream filled cake can stay out for a couple of days, but not a chocolate mousse or custard. Hiya, Do you bake all your cakes in 2 layers? or do you ever bake your cakes in one tin and split? I bake all my cakes in one deep tin and split but think they seem more heavy then when I do them in sandwich tins with same mix. Where am I going wrong? ANSWER: Hi Clair, You are not necessarily doing anything wrong. It is just a fact that when you put more batter in a single pan it will not be as light as if you take that same batter and bake it in two tins. I do bake all of my cakes in two pans. I have tried using the deeper pans and filling them more, then splitting. They come out denser and sometimes don't bake up all the way before burning, as you have probably seen. You can try baking at a lower temperature and see what happens, but I highly recommend using the two pans to bake up a lighter cake. The problem with trying to bake it all at once and splitting is that there is that you are essentially overfilling your pans. Having said all of that if you had a convection oven you would have more luck with baking in the deeper tins. 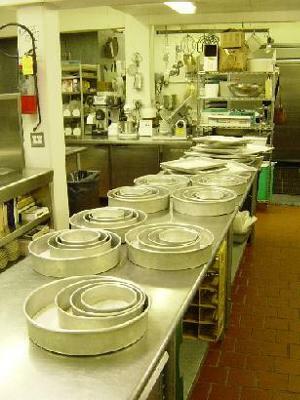 I did sometimes use the deeper pans at the banquet hall kitchen and split the layers for the white cakes. They made me use a mix for that particular cake and mixes, with chemical enhancers tend to bake up fluffier. Here is a link to my baking tips page with a chart on how much batter to use for each pan. I hope that helps you out with your question. Please feel free to ask more if you need to. Thanks for visiting Wedding Cakes For You.